If you use a feed reader such as Google Reader, you can subscribe to the RSS feed of the twitter user you want to "follow". Basically, it'll be like visiting their Twitter page, but you won't show up as a "follower" on Twitter. Put them on a private list. You can then just visit the list to see their tweets. You might want to also add the people you're actually following to that list and change your bookmark to point to it instead of Twitter's home page. 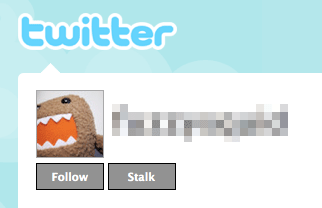 If the account is unprotected and you're using Firefox, there's a plugin called TweetStalk that lets you stalk users instead of following them. You would have to do it manually (by going to their page and seeing what they post). You can't add their content to your homepage unless you follow them. You could write an application that pulls your homepage content and mixes in their timeline content. You could also use a RSS reader to pull in multiple feeds (your homepage and their stream) into a single location. Note: They will only be notified if they have notifications turned on, or they constantly monitor their list of followers to see if it is changing. Not the answer you're looking for? Browse other questions tagged twitter privacy follow or ask your own question. Is there a way to follow the posts of individual Twitter users in Google Reader? Is it possible to force someone you follow to unfollow you on Twitter? Sending a message to someone's Twitter account without following them? How do I request someone I'm following on Twitter to follow me? If I follow someone on Twitter, but they don't follow me, can they see my tweets? Is it possible to see protected Twitter accounts? How to delete all Twitter follow requests? How can I post to Twitter without loading my timeline? Receive Twitter notifications when someone I follow tweets?